The first St. Matthew’s Church was built circa 1768 at Tryon and Churton Streets. 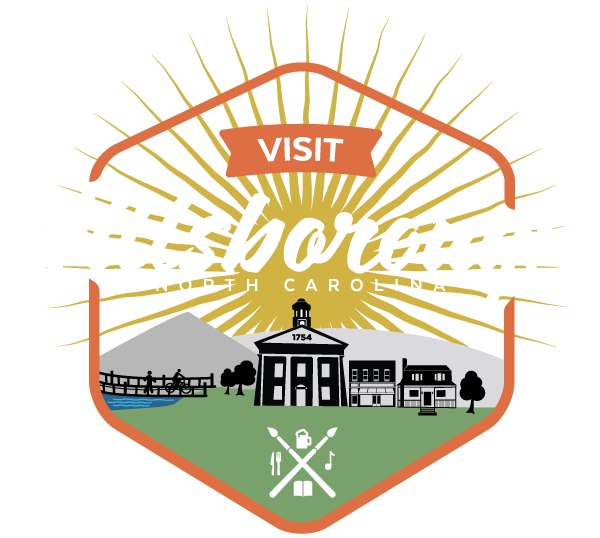 Although it was damaged during the Revolutionary War, it served as the site of the NC Constitutional Convention of 1788 and as the site of Hillsborough Academy, but by 1800 had disappeared either by fire or demolition. The church was reorganized in 1824, and in 1825 the present building was erected on land donated by State Supreme Court Chief Justice Thomas Ruffin (1787-1870). The church was designed with the assistance of State Architect William Nichols and is an early example of the Gothic Revival style in North Carolina. It was built by local brick-mason/architect John Berry and his mentor and partner, Samuel Hancock. The structure was extensively remodeled and refurnished in the 1860s and 1870s; however, the gallery remains, formerly meant for slaves. The Louis Comfort Tiffany Studios created a significant stained glass window, depicting an angel. Many prominent Hillsborough families are buried in the church cemetery, including Chief Justice Thomas Ruffin, many members of the Ruffin family, and members of the Cain, Cameron, Collins, Graham, Hill, Jones, Kirkland, Strudwick, and Webb families. The inside is open to public for special events and historic tours, Graveyard is open to the public daily (dawn to dusk).